Nile was worshipped as a god in Egypt. Actually the Nile was seen as the blood stream of the god Osiris. That’s why the first plague was the turning of the water in the Nile to literal blood from which no one could drink. Really, you want to look to the Nile’s water to quench your thirst? Do you not remember what God had done with the Nile River the day he brought you out of slavery? You want to drink from the blood of Osiris? In Exodus 7:14 we read about the Egyptians digging up around the river to find water to drink, but there wasn’t any! The point of this question is that there isn’t any satisfying water there now either. What do you expect to find? Drinking the waters of the Nile and the waters of the Euphrates is to confront Israel for looking to the waters of this world to quench our thirsts. They never will! Ryken points out two lessons for the church from this verse. He says, “This is partly a lesson about the coming Messiah. 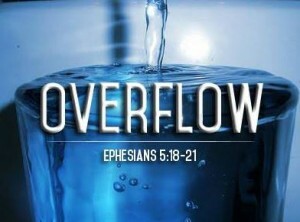 No water can compare with the living water God pours out in Jesus Christ (John 4:10). When the Scottish theologian Thomas Boston (1676–1732) preached on this text, he said, ‘God in Christ is the fountain, all-sufficient in himself. All the creatures are but cisterns; if there is no water brought into them from heaven, or from the spring, they are dry.’”2 The second lesson according to Ryken is, “Politics is a broken cistern. When Christians trust in political solutions to save the nation, they bring judgment on themselves. One reason for the precipitous decline of the mainline church in America has been its engagement in liberal politics. And by aligning itself with the right-wing agenda, the conservative church has fallen into the same trap. The quest for political power destroys the spiritual influence of the church.” I agree! The Church’s purpose is to proclaim the Gospel of Jesus Christ. We offer broken cisterns to people when we preach political messages. We offer broken cisterns as well when we offer messages of self-help, try harder and religious observation and ritual. Only Jesus offers the living water of which if we drink we’ll never thirst again! 2 Thomas Boston, “The Sin of People’s Forsaking God and Betaking Themselves to the Creature in His Stead,” The Complete Works of the Late Rev. Thomas Boston, ed. by Samuel M’Millan, 12 vols., Vol. 10 (London, 1853; repr. Wheaton, IL: Richard Owen Roberts, 1980), pp. 145–177 (esp. p. 147). Philip Graham Ryken, Jeremiah and Lamentations: From Sorrow to Hope, Preaching the Word (Wheaton, IL: Crossway Books, 2001), 43.